Description: The Moose River Ranch contains two miles of the 15-30 foot wide Michigan River, plus a secluded pond full of nice Rainbows. Browns make up the majority of the fish population on this lease, but some fine rainbows can also be caught. 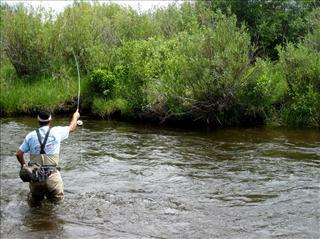 Most fish run 10-14 inches, but a skilled angler has a good chance of catching some 20 inches and longer. Location: This property is located about 8 miles north of Gould in North Park. Capacity: Limited to 2 anglers per day.